The only knowledge I had of City of Brass before first going hands-on with it was that it was made by a team of ex-Bioshock developers, and this was enough to pique my interest. After my time with the game, it is clear that Bioshock had some major influences, but for the familiarity, it is however, wildly different at the same time. 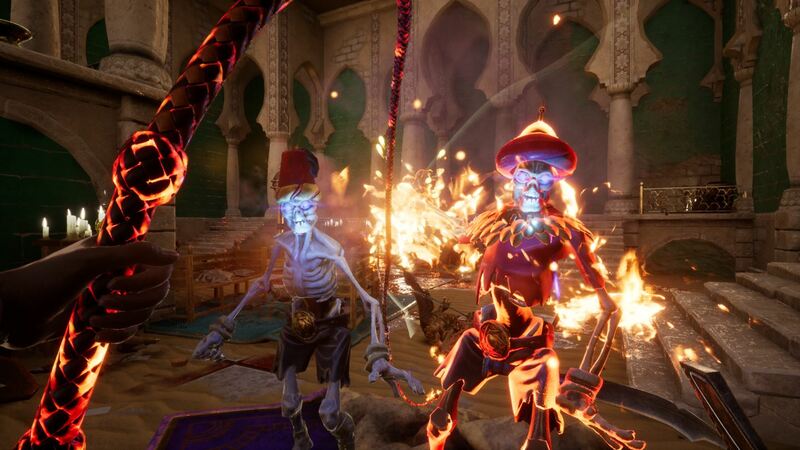 City of Brass is a first-person dungeon crawling roguelite/roguelike game where players are armed with a whip in their left hand and a scimitar in their right. They have decided to try and take on the legendary City of Brass and claim the treasures it holds for their own. This is achieved by traversing the City of Brass levels, procedurally-generated and full of dangers. Deaths are expected and encouraged. It pays to be slow and methodical in your approach when traversing the city. There is a purposefully inputted small delay in cracking the whip or swinging your sword, meaning that you will struggle to overcome the enemies if you go in with reckless abandon. You need a more calculated approach, which helps distinguish this game as more original than other procedurally-generated dungeon crawlers where the expectation is that you adapt on the fly. But you should not be too calculated, because you are up against a pretty concise time limit. The city itself is a stunning location and graphically – this is a stand-out title for the Xbox One – being enhanced for Xbox One X with 4K and HDR makes this the type of game you use to show off the potential of the system to your friends. It comes with an Arabian Nights-inspired look and you really do get that feeling as you run around the areas. More than once I have been caught staring in awe for a fraction too long, only to be clobbered by one of the many enemies that always appear at the most inconvenient times. Thankfully though – like Bioshock – you can usually hear the enemies before you see them. 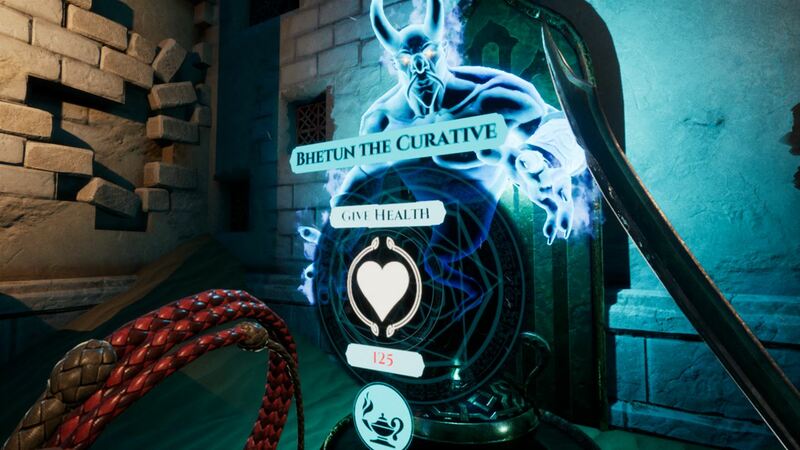 Whereas Bioshock had the splicers muttering to themselves or arguing with others, City of Brass has the hordes of undead coughing and spluttering upon entering a new room or area. But with weapons in both hands – scimitar in the right and the whip in the left – this also has a feel of Bulletstorm to it, and the energy leash that featured in that game. The whip is primarily used to stop the enemies in their tracks before you unleash a flurry of swipes with your scimitar. A well-placed lashing can even disarm your enemies completely or – especially useful in later levels – project enemy projectiles back towards their sender. The Bioshock inspirations continue with the vendors dotted around. They are not identical in their appearance, but their aesthetic certainly gives off a similar vibe. The vendors in City of Brass take the form of blue genies – a clear nod to Aladdin if ever I’ve seen one – and there are various different ones, each offering a variety of wares. One will offer extra health, while another can provide you with a temporary guardian to fight alongside you. Given these are genies, it makes sense that you can also use a wish with them, and at the start of each game you have three wishes. A wish can be used to activate the portal that transports you to a later level providing they have been unlocked, or used on the genies to improve the service they offer you. But three wishes are all you get, and you cannot ask for more. They can though be used on some of the more unfriendly genies too. But all of these come at a price, literally. That treasure you are searching for is dotted around the levels, but also forms the currency by which you use to buy things, and acts as your final score. Leaderboards are also present in the game so you can see how you stack up against other players. 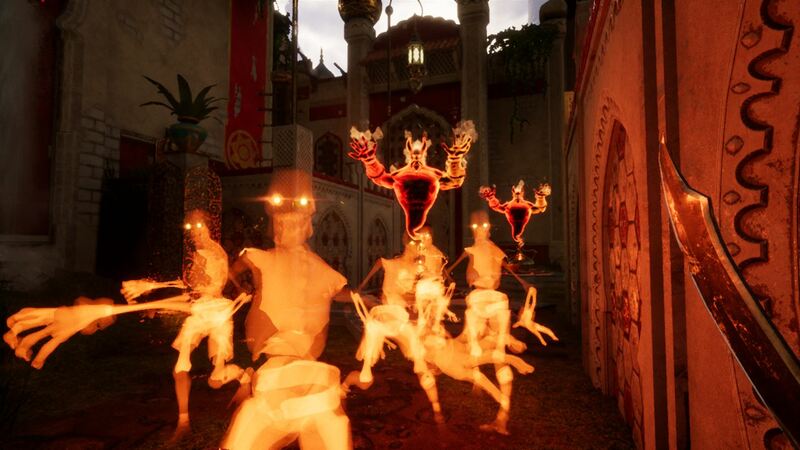 Throughout the City of Brass there are 13 levels: four groups of three with a miniboss at the end of each group and then one final level containing the last boss. They start off hard and only get harder as each one passes. It is this starting difficulty that will put a lot of players off, but as with any roguelite, the gameplay is all about repetition. To avoid that, the levels are all randomly generated, so no two playthroughs are the same. And if you are still struggling to get to grips with City of Brass, there are plenty of gameplay modifiers, known as Blessings and Burdens. Blessings are – thankfully – available from the start of the game and are designed to help you, and do not punish you for doing so. They can be as useful as doubling your health, reducing the cost of everything or even removing the time limit altogether. The Burdens are unlocked after achieving certain milestones and unsurprisingly have the opposite effects as the Blessings. Unlocking a Burden for use also unlocks an Achievement; in total there are 16 Achievements for the game and eight are related to the Burdens. There are more in place for completing the levels that contain the minibosses and unlocking the related portals for use another time. Other Achievements include a variety of ways to complete the game: Completing it any way you can, or without using the portals and finally the toughest, with all Burdens turned on. That one is rightly worth 150G and will separate the men from the boys. 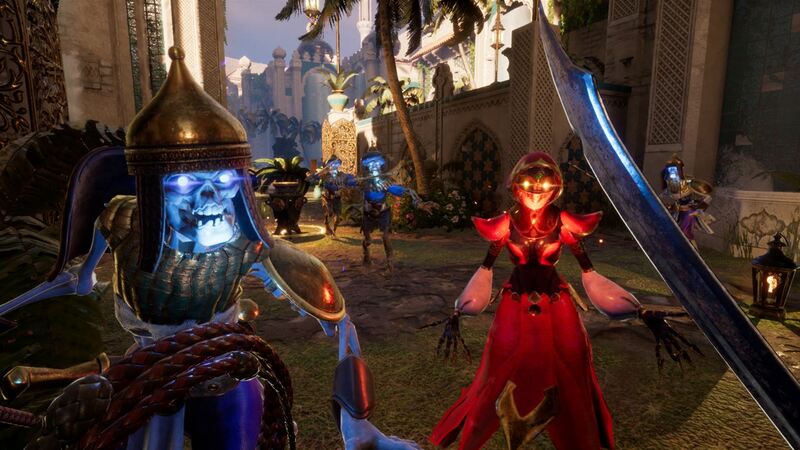 Another interesting feature City of Brass has is the integration of streaming services such as Mixer and Twitch. Viewers on either of those platforms can choose to help or hinder the player using either hashtag commands on Twitch or by spending Sparks on Mixer. These can generate allies or health or loot, but will more than likely be used to generate enemies of varying difficulties. That’s just human nature really. City of Brass is a game worthy of your time. It may be slightly overpriced for what it is – priced at £15.99 – but it’s a good addition to the roguelite genre. If you are a fan of the genre that is. Bioshock fans looking for a similar game though will be disappointed with this offering as whilst it shares some similarities, the main crux of the game is vastly different. But for those looking to test the capabilities of their Xbox One X, this is a game that should definitely be on your list.